WordPress just informed me that today is the third anniversary of my very first post on this blog. I had totally forgotten. How apropos this news is after my last post about the transformation in perception I experienced after communicating via email with Dr. Folta and the angry mob chasing him down. I went back and reread my very first post. Ugh. I am embarrassed by it now. I was so mislead but my intentions were always in the right place. I wanted to inform. I still do! Here a shill. There a shill. Everywhere a shill-shill. Last January 20 at about nine in the evening I got a call from Dr. Kevin Folta. He would be passing through my area of Portland on his way back to the airport after completing an engagement in Salem. If I had time, could we meet for an IPA? He already knew via our email communication that I am most appreciative of a good IPA and could probably steer us in the direction of one of many available in this area. So, let’s see, did I have time to meet the eminent Dr. Folta in person? I thought about it for a millisecond – yes of course I had time! Never mind that my husband and I were leaving for a near month-long trip to SE Asia early the following morning. I wasn’t passing up this opportunity. 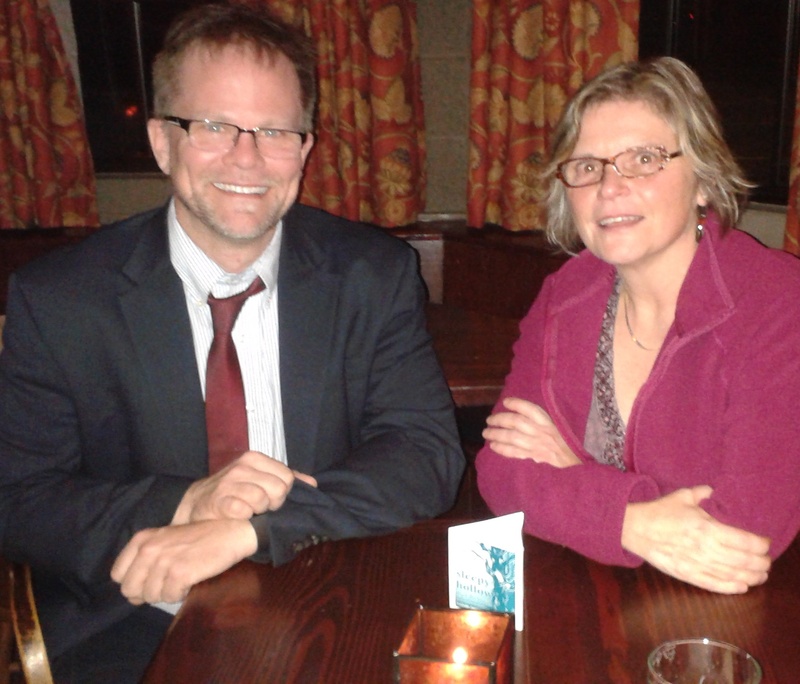 I had known Dr. Folta would be in my neck of the woods as we had discussed possibly meeting. I was delighted it was actually going to happen. My utmost respect and fondness for Kevin Folta go back several years. The backstory is that I used to be an anti-GMO blogger and thought I was helping to save the world from what I perceived at the time to be laboratory-concocted-franken-organisms that were wiggling around in our food and sure to be the reason for the so-called proliferation of modern illness. My brother had just died of brain cancer and I was in a vulnerable place, grieving, looking for answers, and I wanted to stand for something. My generalized fear of GMOs, the case for labeling and the 2012 California Prop 37 campaign all converged at just the right time and I jumped into blog activism with both feet. After several months of being a good soldier for the cause – quoting the likes of Vendana Shiva, Jeffrey Smith and, admittedly, even the Mercola website, after copying and pasting anti-GMO memes and expounding on the evils of this technology and the call for labeling, I came in direct contact with Dr. Folta. I never expected to make his acquaintance, it just sort of happened. A blog comment here, an email there turned into spirited communication between the two of us. And I’m ever so grateful it happened that way. The thing that Dr. Folta did was engage me on an individual level – meaning he took the time to chat with me over email and appeal to my sense of reason and intellect. He wondered was I open-minded enough to examine the facts as I went on with my tirades against crop genetic modification. Was I truly willing to look at what the evidence showed? In short, yes I was. He answered very specific questions I had – about Roundup Ready seeds, glyphosate resistance, the Bt trait, anything I asked him. (Our three-part Q & A is here, here & here). He challenged my way of thinking in a profound way – like a bug crawling around in my ear. It was annoying! I disliked him at first, thought he was way too bold and had a lot of nerve. I could have ignored what he had to say of course. I don’t have a background in science and I could have chosen to believe the maverick group of scientists out there who believe there are dangers with GMOs – as opposed to the tens of thousands who steadfastly agree that the evidence shows – the data shows – no more dangers with GMOs than other breeding methods. I was beginning to experience an internal shift while I pivoted – my mind opening. What exactly were the sources of data that showed GMOs were harmful? When I looked beyond the one-click, fear peddling websites, I realized that the sources I was trusting were not credible. The vast preponderance of molecular biologists and geneticists worldwide, the learned group of experts who work with this branch of science in laboratories every day, know the exact mechanisms whereby genetic modification, or transgenic technology, is realized and much to my surprise, none of it scares them. Why? Because they understand the process. Knowledge takes us out of a fear state. These scientists, Folta included, are in fact excited and see a future rife with possibilities for advantageous use of the technology. Even more profound than all of that though was what Dr. Folta taught me about personal beliefs. And this has changed my life in more ways that just how I feel about GMOs. He was able to steer me round to recognizing that long held beliefs aren’t facts. They feel like and inform our decisions very much like facts but they are not facts. This was a huge realization – absolutely monumental. As human beings we are inclined to treat our beliefs as facts to the point of refusing to accept any information to the contrary, even if it is true and correct. Look no further than fundamental religious faith and fanaticism for a perfect example of this phenomenon. Regarding GMOs, much to my embarrassment I realized I had jumped on a fervent bandwagon, one that was fast becoming elevated to cult status and worst of all, I had no idea what I was talking about. I was a fear-mongering fanatic and I was flat out wrong. I did some deep inner reflecting, some serious soul searching and realized I had to change my position. There was nothing else I could do. Peruse this blog and you will see the whole story unfold through my posts. I left all of it as a testament to my journey. Well, fast forward a few years and the public debate rages on. I have been hated by anti-GMO types ever since. They think Monsanto pays me (in addition to the additional tens of thousands of scientists, farmers and others worldwide who speak in favor of GMOs – here a shill, there a shill, everywhere a shill-shill). They think I am evil, a traitor, stupid, duped, naive and should stick to music and humanities (what I studied in college) and get out of the health blog business (which is no business as I am entirely volunteer). They stop at nothing to discredit and hurl insults at me. In recent months though, something much more sinister has been going on. Certain organized factions of this general pool of GMO haters have carried out what amounts to a witch hunt against Dr. Folta – and it just gets uglier and more ridiculous. (Read details here.) Using the Freedom of Information Act (FOIA), the right-to-know folks have demanded he turn over all his university emails that fall within the agribusiness category since 2012. They are looking for financial ties to biotech – namely – Monsanto so they can self-righteously scream “see he is paid to say what he says!” These groups are sure that Folta and his peers are industry lackeys, paid to lie about GMOs, paid to deceive and deliberately withhold the real truth. It has been my observation as I’ve become more acquainted with him over time that he works tirelessly, is as dedicated to his work as is humanly possible, is not particularly fond of big business, is actually for the little guy and mom and pop businesses and most of all, wants people to know what he knows – that this fear of transgenic technology, of GMOs, is unfounded. The data is just not there to support the fear. But there are still those that seek to ruin this man because what he teaches is in direct contrast to their beliefs so they will not accept it, much like fundamentalist Christians won’t accept that evolution happened. Through the FOIA inquiries, both Dr. Folta and the Universtiy of Florida have been subjected to time consuming, tedious examinations of electronic correspondence, not to mention what has been spent in lawyer fees. Your tax money at work! So, did the haters find their smoking gun? I’m sure they will say they did, in the form of a 25K grant from Monsanto to the University of Florida for science outreach. This is not and never was personal income to Dr. Folta. This grant equates to some travel expenses and speaking engagement fees. Hardly making him rich and certainly not worth lying for because a scientist lives on his or her reputation! But in light of this so-called ‘find’ – these GMO haters think they’ve turned the tables on Dr. Folta. Because my blog refers to him a lot I’m getting snarky comments that now we know what a shill he really is and so on. Well, I hate to burst the bubble of you haters out there but the university gave the Monsanto money to charity. Yes, you heard me. Because of the continuing harassment, that was the preferable choice. The shill gambit is a simple way to discredit those that speak language incompatible with the cult’s beliefs. The donation came to support a science communication outreach program. Nothing went to me personally. My program was the same before, during, and now after the funding period, so their donation had zero effect on the content. They didn’t control the message. I would not let that happen. After the endless distortions, online reputation destruction and threats to my lab and home, the university transferred the donation from the communications program to a campus food pantry. So no funds from Monsanto, in fact, once the university defunded the program I now have a $11,000 deficit. Before the Monsanto support I paid for the program sort of personally. Speaker fees, honoraria, etc all went into the outreach program. These were fees from $500-$5000 that could have been personally absorbed, but instead were put into communications outreach. The company did nothing wrong. I did nothing wrong. I’m teaching science that the cult does not want taught, as it costs them market share and treads on their beliefs. They’d rather trash the career of a scientist dedicated to public outreach and public science for 30 years, than to actually learn the science. 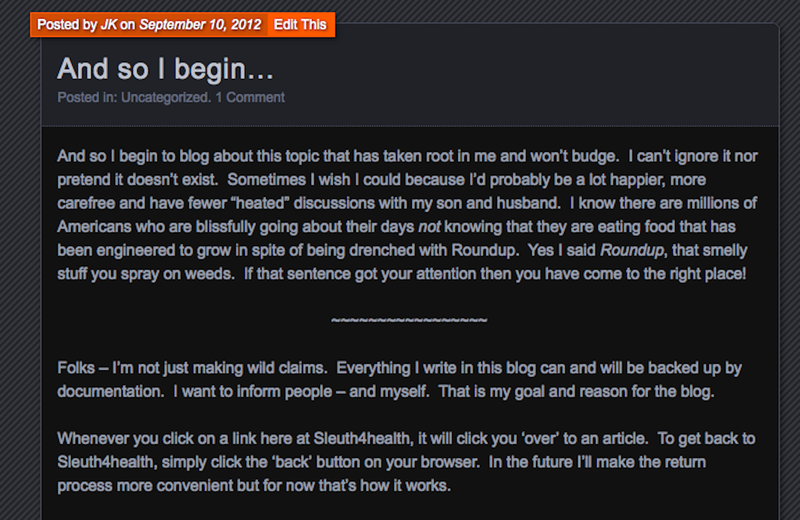 Also, from his blog, read his Q & A about agribusiness monies here. So on that night in January, Dr. Folta and I downed a few of Oregon’s finest craft beers. We talked about our families, about how we all might meet again in a social way and wouldn’t that be fun. We talked about his unceasing commitment to science education. I thoroughly enjoyed the time we spent together and feel lucky to have met him face to face. He probably doesn’t even know what a fan of his I really am! When someone teaches you something profound, you don’t ever forget it. I can count on one hand those teachers in my life who changed me. They are so very special to me and I can only hope I have had a similar effect on even one person in my lifetime.